Shamrock Cottage01263 715779work01603 870304fax Self-cateringShamrock Cottage is pretty cottage, built in the traditional Norfolk brick and flint and is particularly noted for its bright conservatory and south facing garden. It is set in Hindrigham, a peaceful rural village in North Norfolk, with great access to the coast, various village pubs and the Priory at Binham. • Other: Linen & towels provided. Cot and highchair . Steep narrow stairs, with hand rail, may not be suitable for guests with restricted mobility. Shamrock Cottage offers weekly bookings starting on Saturday. Shamrock Cottage is pretty cottage, built in the traditional Norfolk brick and flint and is particularly noted for its bright conservatory and south facing garden. 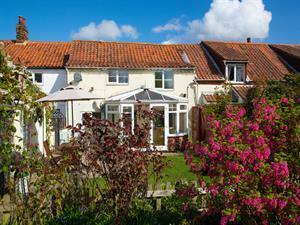 It is set in Hindrigham, a peaceful rural village in North Norfolk, with great access to the coast, various village pubs and the Priory at Binham.